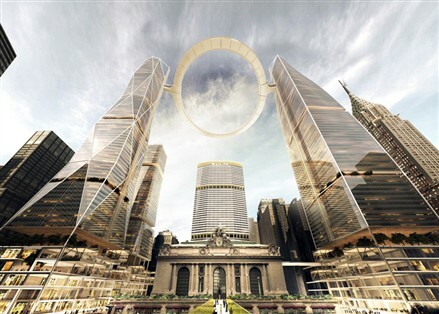 Architecture firm SOM is proposing to build a gigantic, floating halo over New York's Grand Central station allowing visitors a full 360 degree view of the city. The observation deck would have the ability to move up and down, suspended between two skyscrapers. Throughout the history of New York City, urban growth has been matched by grand civic gestures," said SOM partner Roger Duffy. The proposal is part of a plan initiated by the Municipal Art Society of New York to "keep midtown from becoming an auxiliary neighborhood to Times Square, full of hotels and chain restaurants." 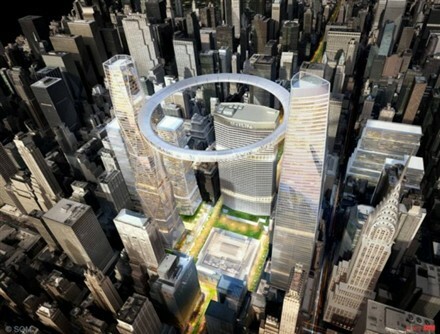 MAS NYC invited three architecture firms who have successfully created structures in New York before to submit their rezoning plans to revamp the 100-year-old station."